NEW YORK, NY--(Marketwire - February 17, 2010) - Conductor, a leading provider of search engine optimization technology and services, today released their third research report on the Natural Search Trends of the Fortune 500 detailing the search visibility and optimization effectiveness of the Fortune 500. Completed during the fourth quarter of 2009, Conductor's analysis found more than half of Fortune 500 companies had almost no natural search visibility, receiving an "F" or failing visibility score with their targeted keywords not ranking within the top 100 natural search results. None of the Fortune 500 companies had a majority of their keywords ranking in the top 25 search results. This study provides insight into search trends of the Fortune 500 at a high industry level as well as taking a more granular look at individual Fortune 500 companies. The three least visible of the Fortune 500 industries include: 'Public Administration,' 'Agriculture, Forestry, Fishing and Hunting' and 'Mining, Quarrying, Oil and Gas Extraction.' Market leaders in the three most competitive industries include: Amazon.com in the Retail industry, New York Life in the Finance and Insurance industry and Dish Network in the Information industry. significant number of their terms in the top results. five in search engine results. the top 100 search engine results. Conductor's study is the first to systematically track Fortune 500 brands' natural search effectiveness over time. The Q4 study analyzes 6.7 million paid keywords, examines the paid/natural visibility correlation and investigates the effect of more specific 'long tail' searches for these brands. The companies examined were the top 500 public companies included in Fortune magazine's 2009 Fortune 500 annual ranking of America's largest corporations. Conductor is the leading provider of SEO measurement and optimization technology, empowering enterprise marketers to manage and improve their SEO efforts. Conductor Searchlight is a subscription-based, software as a service (SaaS) platform which enables customers to gather competitive data, prioritize and improve their decision making, and accurately measure the ROI of their SEO efforts. Conductor also offers a range of associated professional services to its over 250 Fortune 500 and Internet Retailer 500 clients, a majority of the leading interactive agencies, and some of the world's most prestigious publications. Based in Manhattan, the company was founded in 2005, and is one of the fastest growing companies in New York. 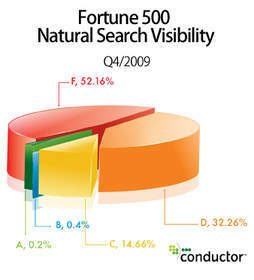 Conductor's study reports half of Fortune 500 companies had almost no natural search visibility.